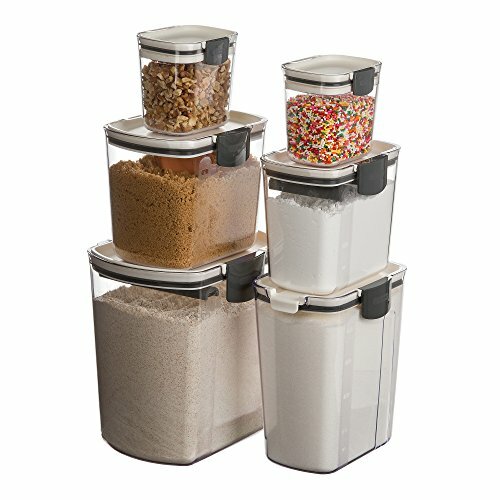 The Prepworks by Progressive 6-Piece Storage Container Set combines high quality construction with a silicone seal for air-tight storage. This set include one of each Flour, Granulated Sugar, Brown Sugar, Powdered Sugar Keepers and 2 Mini Pro Keepers. The 4-quart Flour Keeper will hold easily hold a 5lb bag of flour and has measurement markings clearly displaying remaining flour. It has a leveling bar clip across the bin for easy, mess free measuring, or it can snap and store under the lid. The 2.5-quart Sugar easily hold a 4lb. bag of sugar and has measurement markings clearly displaying the remaining sugar. The flip-to-pour spout and contoured body make for easy one-handed use. The 1.5-quart Brown Sugar easily holds a 2lb bag of brown sugar and has measurement markings clearly display remaining brown sugar. It includes a removable terra cotta disk that you just soak in water, then snap it under the air-tight lid or place it directly in your sugar to keep it from drying out. The 1.4-quart Powdered Sugar will easily hold a 1lb bag of powdered sugar and includes a dusting/measuring spoon and a removable leveling bar for mess-free measuring and both clip under the lid for easy storage. It also has measurement markings clearly displaying the remaining powdered sugar. The 1.5 cup Mini hold up to a standard box of baking soda. They are a perfect kitchen organizer for spices, herbs, candy and snacks. The included leveler and sliding dusting screen are removable and sit under the lid for easy storage. All keepers in this set have a patent pending stainless steel hinges that swing wide open for no-fuss access to fill or measure, an easy-catch latch that holds the lid tightly closed and all will fit into the dishwasher for easy care.